This bug was reported by some users at this ticket: https://mcreator.net/tracker/issue/44216, but this ticket is about a different issue. If this happens, the best option to recover the workspace is to go to user/workspace folder and change the extension of backup-* files to .mcr. Then copy these backups to a safe place, reinstall MCreator and import the workspace .mcr backups in the freshly installed MCreator. I actually have the same Loading workspace Problem, but im using 1.7.10,i tried uninstalling and reinstalling it but it wont work. is there something I got to do to make it work, I want to learn Everything so I can Make my own mod. 1.7.10 has many bugs that were fixed in newer versions. There are no plans for fixes in 1.7.10 version in the near future. UserofBricks, yes, deleting a part of the name. So I went to the folder holding the workspaces and the only file there was the settings. I had gone there before and it had the workspace files and the backups but they are all gone and I did nothing to remove them. If you installed new version and not switched a workspaces yet, it is normal to be empty. This is how it works at the moment, but we will change (improve) this. I had more than one backup files so I changed all of their names. But I'm still stuck at the "loading workspace data" screen. Perhaps i should delete all the files in that folder? Sorry, this will not work; I have forgotten how exactly this works. Actually, the best option is to reinstall MCreator, but keep these .mcr files and import in the new MCreator one of the backups. Does this actually fix the problem, or do I just have to continuously reinstall mcreator? There no back up files in the wokspace directory. To get the backup files you need to go to another workspace while MCreator is working. Only if this is done will the workspace files appear. 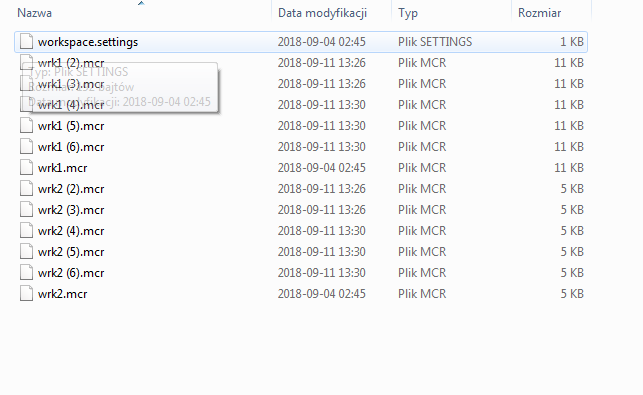 Alright, but does saving the backup files as mcr ones actually fix the issue, or just lets me save my progress, but I still have to reinstal mcretor? Sadly it just lets you save your progress. You can just delete workspace.mcreator file instead of reintalling MCreator. This bug will be fixed in 1.8.1 where all workspace related file write operations will be atomic to prevent this from happening. cool. on a side note is there "add items to the players inventory" code block is going to be fixed in the ner future?